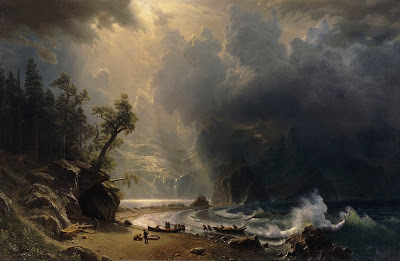 The exhibition Beauty & Bounty: American Art in an Age of Exploration is at the Seattle Art Museum (SAM) from June 30 – September 11. We popped in Thursday night to catch it before it closed and had a good time. A well-spoken and engaging docent led a 7:00 pm tour that was awesome. The exhibition includes landscape paintings and photos from the last half of the 19th century and the beginning of the 20th century that focus on how American artists reacted to and recorded nature in the still relatively new country of America. Nature and in particular, the West were sources of wonder, solace, and opportunity. Even as the country struggled through the Civil War (1861 – 1865), artists kept exploring and depicting nature. Several of the artists were key figures in the westward expansion of the United States. Many were instrumental in the formation of natural parks such as the landscape painters Thomas Moran (1837 – 1926), Albert Bierstadt (1830 – 1902), Sanford Robinson Gifford (1823 – 1880), Federic Edwin Church (1826 – 1900), George Inness (1825 – 1894), and John Frederick Kensett (1816 – 1872) – of which you see works in the Beauty & Bounty. 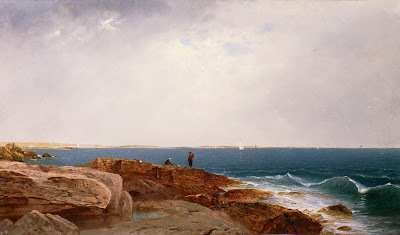 One artist that stood out for us was Martin Johnson Heade (1819- 1904) and his salt marsh landscapes of the East Coast. Heade seemed to stand apart from the other landscape painters in his approach and we couldn’t escape being reminded of Andrew Weyth ever so slightly. The first few rooms of Beauty & Bounty prepare you ready for the high point (or maybe low point for some) of the exhibit: Albert Bierstadt’s Puget Sound on the Pacific  (shown at the head of this post). 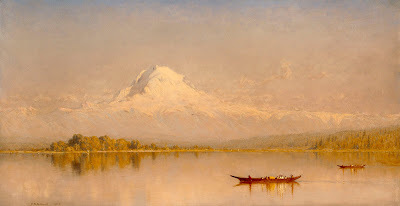 This large oil painting though it is titled Puget Sound was painted with Bierstadt never having seen the Puget Sound. Instead he relied on other’s writing and imagery (especially of Northwest tribes) and a dollop of imagination to create the work. This fact later caused a bit of a dimming of his artistic star. 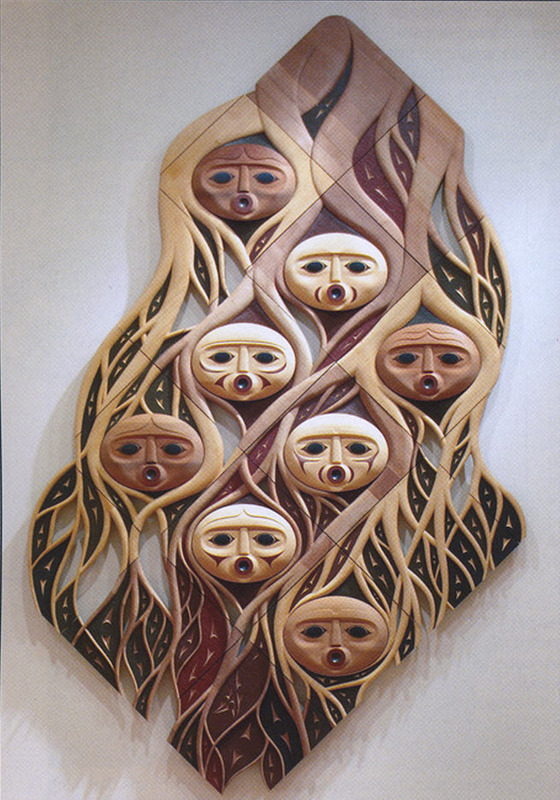 We were impressed by a painting by Emily Inez Denny (1853 – 1918), the eldest child of Seattle pioneers David and Louisa Denny. In the painting, The San Juans and the Olympic Range (1888), she really captures the particular grey light of Puget Sound. As a companion exhibit to Beauty & Bounty, SAM is also presenting Reclaimed: Nature and Place Through Contemporary Eyes. 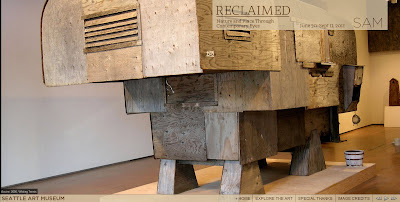 There are many interesting pieces in Reclaimed, two of which are Whiting Tennis’s Bovine  – a camper made of found plywood (and a little bit of Hank Williams) - and Susan Point’s beautiful and sinuous carving The First People  - made of red and yellow cedar that pays homage to her Salish heritage. In contrast to Beauty & Bounty, the pieces of Reclaimed instead of depicting nature like Moran or Bierstadt did, comment on the bounty of nature and often use raw materials in that commentary.